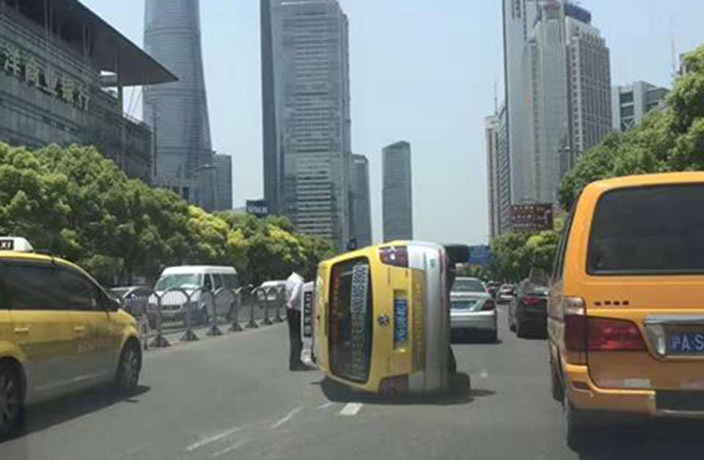 Drivers along Shanghai's Century Avenue on Friday morning were in for a bit of a surprise after an overturned taxi was spotted smack dab in the middle of the street. The accident happened at around 11am near Pudong Nan Lu in Shanghai's Lujiazui business district on May 26. The Expo cab was on its way towards Puxi when it reportedly bumped into a silver car. As the driver rushed to put the emergency brakes on, the entire vehicle rolled over. Luckily it seems like the driver of the cab emerged from the accident unharmed, and no passengers were trapped in the sideways car. Police were also immediately at the scene to sort out the situation. A video went viral after a car was shown precariously perched upon a barrier in the middle of a highway in Shanghai. The driver who crashed into the main entrance of a popular downtown Shanghai bar and restaurant was drunk, police have revealed. Video has emerged of a car accident that took place at Sasha's and Zapata's on Thursday evening.